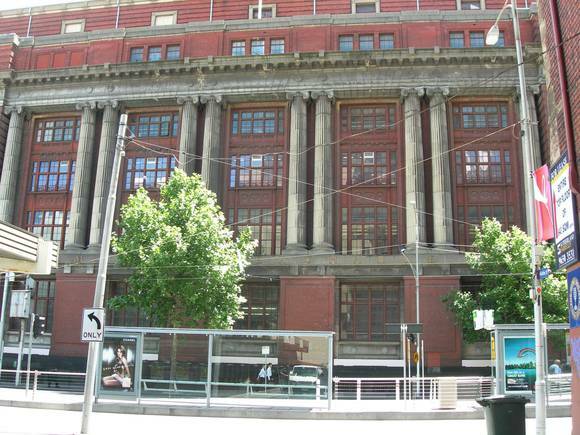 Former Mail Exchange Building, 670-696 Bourke Street, corner of Spencer Street, City of Melbourne. 2. The land marked L-1 on Plan No. 604536F(A), being part of the land described in Register Book Certificate of Title Volume 9209 Folio 999. The Former Mail Exchange, completed in 1917, was designed by Commonwealth Home Affairs architect John Smith Murdoch. The seven storey, steel-framed building was constructed in a beaux-arts classical style, with a red brick facade featuring rustication at the corners and a trabeated facade at first to third floor levels. The dominant feature of the facade is the paired giant order fluted columns, with ionic capitals, rising through three storeys. Bronzed steel framed windows fill the bays between the columns, contrasting with the mass and solidity of the masonry. Windows in each corner also rise three storeys from small balconettes with a simple bronzed steel balustrade. An under-road tunnel connects the sub-basement to Platform 2 at Spencer Street Station and was used for the conveyance of mail to trains. The Former Mail Exchange is of architectural and historical significance to the State of Victoria. The Former Mail Exchange is of architectural significance as a major example of the early work of the Commonwealth Department of Works and its first chief architect, J.S. Murdoch. The building is a distinguished example of beaux-arts classical design, and its Greek flavour was ten years ahead of Melbournes mainstream Modern Greek revival. The beaux-arts style was not common in Australia, tending to be used for large and important buildings. It was the sense of monumentality that it imparted that Murdoch considered appropriate for Commonwealth buildings. Classicism became the style of choice for Commonwealth buildings during Murdochs time. Its dignified conservatism was thought appropriate for major public buildings, and is particularly evident in the public buildings of Canberra, such as the Old Parliament House (1927), also designed by Murdoch. Murdoch was a major figure in the development of Canberra, being a judge of the competition to design the city and responsible for many of the capitals buildings himself. He was also responsible for a number of other significant public buildings throughout Australia. The Former Mail Exchange is of historical significance as an important reminder of the development of the Australian mail service in the early decades of the 20th century. The building was erected to ease congestion and provide better conditions than those prevailing at the Melbourne GPO. Its direct tunnel link to Spencer Street Station, modern and well-designed internal spaces and system of chutes to transport mail around the building demonstrated a concerted effort to modernise the mail system in the early years of the new Commonwealth. This modernity was reflected in the materials of the building, the steel framed windows being an early example of the use of such technology. The proximity of the building to Spencer Street Station reflects the important connections between the railways and the postal service in the development of postal communications throughout the State.